Satire from bystanders may cut both ways, but satire and humor from participants can be simultaneously funny and apt. Oddly enough, the sentiment in the placard may be in response to some "pox on both houses" satire by Jon Stewart in recent days. 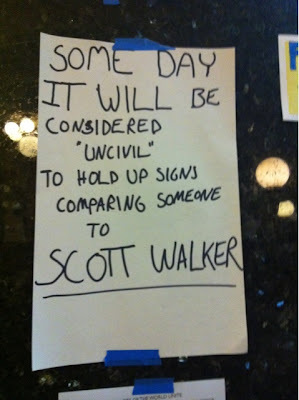 There is quite a lot of funny stuff from Wisconsin, intentionally and otherwise. Please do not damage the pyramids. We will not rebuild. The title of this post is a variant of a line from Tom Lehrer's song "The Folk Song Army."